MSS: An egg in space - or an egg in a vacuum - what would happen? So an egg can stand pressure from outside pushing in, is this the opposite of what you'd get in a vacuum? I'd expect a vacuum to exert a sucking pressure pulling all sides of the egg outwards. Eggs generally don't explode when you boil them (when you think the high temp might expand the air pocket inside). In saying this, if you put an egg into a microwave, it makes a very gooey mess! It might depend how quickly the pressure changed. I think there's a fair degree of permeability through the shell. We have chooks and our older chook lays thinner egg shells too so shell thickness might be a factor too. Air leaks in and out through the egg, but only slowly. I don't know if water does. If the egg is suddenly put in a vacuum or if water can't get out then the egg breaks open, goopy stuff leaks everywhere, the chicken if any dies, the liquids boil away. If the pressure is reduced slowly and water can get out - and I don't know how long that would take, maybe hours or days? - the internal vacua of the egg rupture, the chicken if any dies, the liquids boil away, the egg is left dry and lifeless. None of this is much fun, especially for the egg. There's no good way for this to end. "I don't know much about eggs, you should ask a biologist. Here's a guess: Air leaks in and out through the egg, but only slowly. I don't know if water does. If the egg is suddenly put in a vacuum or if water can't get out then the egg breaks open, goopy stuff leaks everywhere, the chicken if any dies, the liquids boil away. If the pressure is reduced slowly and water can get out - and I don't know how long that would take, maybe hours or days? - the internal vacua of the egg rupture, the chicken if any dies, the liquids boil away, the egg is left dry and lifeless. None of this is much fun, especially for the egg. There's no good way for this to end." Thank you Mr Science for bringing this pressing national security issue to the public's attention. For too long the threat of chickens dropping eggs on us from space has been denied its due consideration as a genuine menace to the security of our peace-loving, but somewhat blinkered nation. As a specialist Defence Chickenologist, I have been monitoring the global arms race in chickens. Third world nations were quick to recognise the equivalence of chickens and fighter jets and have been active in the chicken/fighter sphere for many years (read our Minister for Defence's statement on the topic here: http://www.minister.defence.gov.au/gregCombetSpeechtpl.cfm?CurrentId=10522). Our former Prime Minister, Mr Rudd was keenly aware of the issue, although he tended to focus on the defence implications of Chinese chickens and the stragic threat they posted to first wrld countries (see http://news.ninemsn.com.au/national/1044339/rudd-ups-civilian-effort-in-afghanistan). It was a sad day for both Australia and Defence Chickenology when the fowl Julia Gillard stole, yes, stole the highest office in the land. Ms Gillard's ascension to the Prime Minister's Office has set the defence chicken movement back decades. She has turned the whole debate into a farce (see for example: http://www.abc.net.au/news/stories/2010/07/05/2944534.htm?section=features). I look forward to your next post on this critical topic. My first thought was that something would happen, but nothing too exciting or explosive. People don't really explode in space, after all! We and the egg are used to one atmosphere, and we can withstand several atmospheres (as in deep sea diving) without injury if you're careful. By contrast, you can't have negative pressure, only lower pressure - down to zero. An egg in a vacuum has one less atmosphere of pressure on it than it usually would, and I don't think the pressure inside is so great as to make it explode. The pressure might not make as much difference here as it would for water, say; at high altitudes on Earth, it can apparently take longer to cook eggs - possibly because the boiling water is at a lower temperature. So my guess is that in space, the white and yolk would probably freeze, and even on Earth this cracks the shell. I don't think the egg will become the egg equivalent of steam; it's made of complex proteins and won't behave the same way as a simple, pure substance like water. The other variable is that while the inside may have less strength than the outside, a chick using its egg tooth or beak to peck a hole by applying force at a single point isn't the same as equal force on the entire shell. Probably the force wouldn't be uniform, though, since the distribution of yolk and white inside isn't uniform either. So, to sum up all my musings and lunchtime Google research: I think the egg would freeze and the shell would crack, but I don't think it would explode. 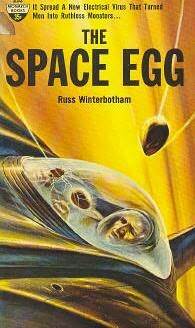 I wonder what would happen if you took an egg in the vacuum of space, empty it via a tiny hole, and somehow perfectly seal the hole. If you were to take it back to earth, would it shoot up on its own or would it implode?